Anyone who has ever taken advantage of any of The Schuylkill River Trail knows what an amazing addition it has been in Philadelphia! The Schuylkill Banks section located in Center City begins at the Fairmount Water Works (by the Art Museum) and has expanded to Christian Street (so far). The jogging/walking/biking trail includes an ADA accessible connector bridge, boardwalk, and dog park in the Fitler Square area…not to mention a ton of things to do from picnicking and yoga to fishing and kayaking. The most recent expansion completed was from South to Christian Streets featuring access points at The CHOP Bridge and Schuylkill Banks Boardwalk at South Street. This extended the trail an additional 1400 feet past the Boardwalk into the Graduate Hospital neighborhood. There are plans in the pipeline to continue the trail from Christian Street to Grays Ferry Crescent by 2020 and to open an ADA accessible swing bridge that would provide a link from Grays Ferry Crescent to the west bank of the Schuylkill, eventually extending the trail to Bartram’s Garden. 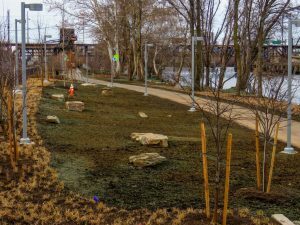 Learn more about the trail and things to do by clicking here: Explore The Schuylkill Banks.